We are already living in a country almost entirely fueled by debt, let that sink in…. With the US national debt currently standing at $19.9 trillion, according to the US Debt Clock. And it’s not just the US; the entire world is living in the largest debt bubble in history, with global debt levels standing at $217 trillion, or 325% of world GDP as at the beginning of the year. Against this larger backdrop, smaller bubbles form, and when they burst, the consequences are devastating. The most recent was of course the housing bubble burst a decade ago, precipitating the worst economic recession in recent history; one which we have yet to fully recover from. And the officials in the Federal Reserve seem absolutely incompetent or unwilling to spot such bubbles before they emerge. 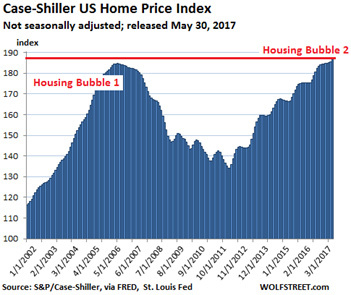 As Ben Bernanke says, “spotting bubbles is hard”, a sentiment recently echoed by Minneapolis Fed President Neel Kashkari in a recent essay. With that being the point of view expressed by our Fed officials, what chance do they have of spotting the next bubble and try to correct it before it bursts? What is the next bubble anyway? Surely it can’t be housing again; after all, wouldn’t they have learnt from their previous mistakes? That seems like wistful thinking because as the Fed’s own data shows, we might very well be in the midst of the next housing bubble, and it may be even larger than the one in 2007. 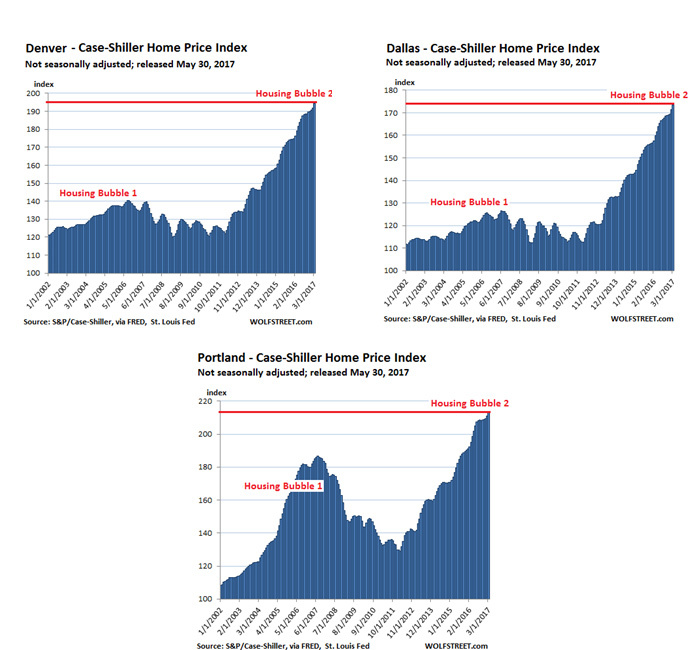 Consider the data from the S&P CoreLogic Case-Shiller National Home Price Index. As you can see, as of March 2017 the index stood at 198.26 which is 11% higher than the previous peak back in May 2006. Zillow has already stated the national median home value in April 2017 was $198,000, which is not only a 7.3% year on year increase, but higher than the pre-recession peak of $196,600 in April 2007. And the National Association of Realtors reported that the median existing single-family home price was $246,100 in April 2017, compared to $230,400 back in June 2006. And that’s just data on a national level. If we look at the Case-Shiller index on a city by city basis, you will see that the situation in some cities is far more drastic. Case in point, Denver, Dallas, and Portland. Of course, these figures have yet to account for the effect of inflation, which according to the Fed’s Personal Consumption Expenditures figures have totaled about 17% since 2006. But even accounting for inflation’s effect, the figures are still worrying, especially in some of the cities such as the ones mentioned above. If there’s one thing that will send the housing market crashing real quick, it’s people being unable to afford their mortgages. And after bottoming out somewhere around late 2014 / early 2015, it looks like US bankruptcies are on the rise again. 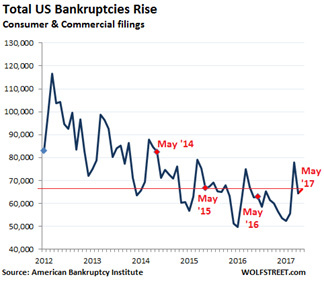 According to the American Bankruptcy Institute, total US bankruptcy filings for both consumers and businesses were 69,668 in May 2017; the highest since May 2014. And with more and more Americans moving to part time and lower wage jobs despite the declining ‘official’ unemployment figures, it is likely that bankruptcy filings will continue to rise. A housing bubble and increasing bankruptcy filings are each by themselves a major cause of concern. But when taken in tandem, their combined effects could be economically explosive. That’s why intelligent investors are diversifying their portfolios into ‘hard value’ commodities such as gold and silver. Recently, money managers and hedge funds have been jumping back into gold, spurred on political angst in the US and Europe. For retail investors, these commodities provide an effective hedge against the potential collapse of other asset classes such as stocks and property.